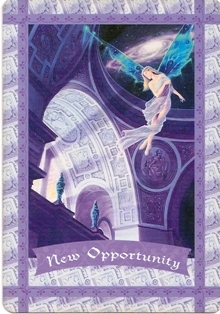 New Opportunity is always a fun card to draw because she signals new work, new location, or something unexpected. I could hope for both right now, actually. I’m not happy with my job status even though I’m wanting to hold on to the job for at least two years just to establish good, reliable work history. I’ve been working at being able to move, even though it’s been more difficult than I’d have liked. Either way, I’d welcome a new opportunity. Then again, it may come from way out in left field, something I’d not even have imagined or thought of… which adds an element of excitement. Card Meaning: Be aware of a huge new opportunity being presented to you. It is safe for you to trust and enter into this new realm. Description: A momentous opportunity is being presented to you. It could be in the form of someone making a business proposal to you, a new idea that enters your mind, or an investment opportunity. It could even come in the form of a loss, in which you are about to gain something even more suitable. Even though you may feel intimidated or unqualified to move to the next level, be assured that heaven is reaching its hand through the window, guiding and protecting you as you soar upward. If you need help trusting the validity of the new opportunity, pray for spiritual guidance. You will soon believe in the trustworthiness of this gift, and you will know that you deserve heaven’s help. Affirmation: I notice and embrace the new opportunities that are now in my life.